There is not yet a detailed report to cite (Regehr et al. 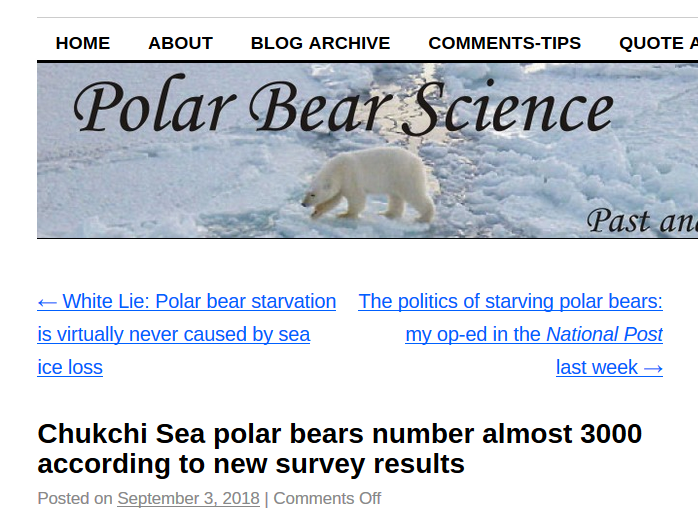 in prep), but the numbers were announced at the 10th meeting of the Russian-American Commission on Polar Bears held at the end of July this year (AC SWG 2018) by Eric Regehr (formerly of the US Fish & Wildlife Service, as of 2017 at the University of Washington). [h/t to G.H.] This was the same report that raised the quota for subsistence hunting in the Chukchi from 58 to 85, based on these new figures, as I discussed last week. Recent research on polar bears and their prey has been on-going in the Chukchi Sea since 2008 (Crawford et al. 2015; Crawford and Quackenbush 2013; Rode and Regehr 2010; Regehr et al. 2010, Rode et al. 2014, 2015, 2018). Now it’s all coming together to paint a picture of a large population of polar bears in excellent physical condition, with strong reproduction and cub survival (such as triplet litters sighted on numberous occasions), despite a much longer ice-free period in summer than in the 1980s.